The Washington state schools chief, a UW professor and fourth-grade teacher from Seattle imagine how they would reinvent public schools to support more than just students from white and wealthy communities. It’s no secret that Washington’s public schools don’t look like they used to. Twenty years ago, nearly four of every five students identified as white. Today, that number is about 55 percent. The share of students living in poverty, meanwhile, rose from 30 percent in 1997 to 43 percent last year. The number of students learning English also soared, to nearly 125,000 last year, and demographic forecasts predict that trend will continue. But the consensus among three educators speaking Saturday at the first Crosscut Festival at Seattle University was that the Evergreen State has not transformed its public schools quickly enough to keep up with the shifting demographics. “We have a culture challenge: We all grew up in a system that worked for us, (so) why doesn’t it just keep working for everybody?” said state schools chief Chris Reykdal, a former high school history teacher. “Our seniors in high school, by the way, look nothing like our kindergartners right now. That’s how rapidly these changes are occurring,” he added. 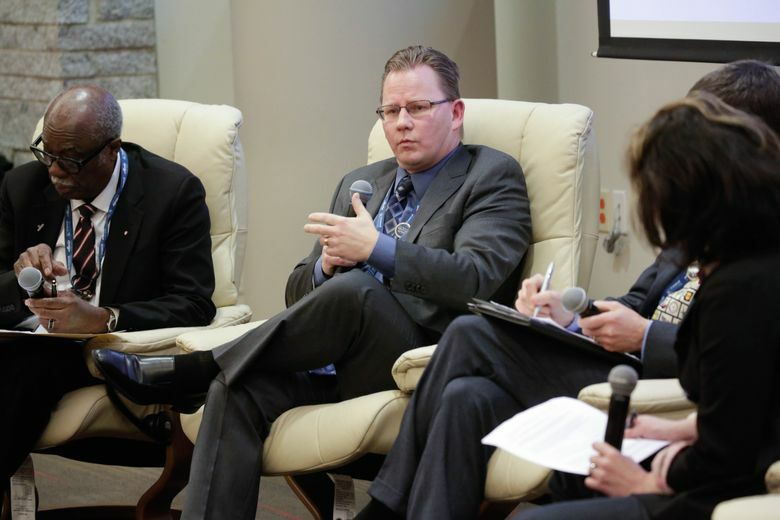 Reykdal joined Lyon Terry, the 2015 state teacher of the year, and University of Washington professor James Banks on a panel about re-engineering public schools for equity in education. Education Lab reporter Claudia Rowe moderated the panel, asking what exactly educators need to do differently than they did 40 years ago. For Terry, his list started with raising expectations for students. The panelists, for example, each criticized the current emphasis — thanks to federal testing requirements — on math and reading scores. That emphasis, they said, loses sight of how well schools prepare students for more than just taking a test. “We really do need to think about what is a good school beyond academic achievement. Can kids get along with each other?” Banks said. The panelists also called for the state to pay for a longer school year, districts to diversify their curriculum to better reflect students’ identities and the private and nonprofit sectors to partner with schools to help families living in poverty. But on an even smaller scale, Reykdal encouraged everyone in Washington to consider whether they would buy into a system that funnels less money into schools with more white and wealthy students in order to help less-advantaged children. “Can we tolerate in our communities of white privilege and wealth getting less and paying more so that communities who have been adversely impacted for 130 years get more and pay a little less? Can we really tolerate that?” Reykdal said.